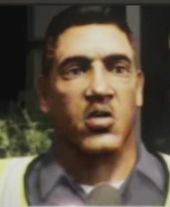 Albert Stalley is a character in the HD Universe who appears as a minor character in Grand Theft Auto V.
Albert Stalley is, in 2013, a police officer with the Los Santos Police Department who also works as a security guard for Vangelico's Fine Jewelry. While a heist is taking place he, unaware of the events, warns Franklin Clinton to move his vehicle away from the store. Michael De Santa, however, later helps Franklin escape his attention by threatening him with a film quote. Stalley is later interviewed by Weazel News about the events, leading Trevor Philips to realise that Michael had not died nine years earlier. This page was last modified on 7 February 2014, at 23:06.